Yvette Cooper, Andy Burnham and Chuka Umunna are expected to join the race but backbencher Dan Jarvis has ruled himself out. The ruling National Executive Committee will meet early next week to agree a timetable for the leadership contest. Mr Miliband said he was "truly sorry" for a showing which left Labour with 232 MPs, sustaining heavy losses at the hands of the SNP in Scotland and failing to make significant gains elsewhere. Prime Minister David Cameron has promised to lead a government for "one nation" after his party won its first majority since 1992 with 331 seats. Ms Cooper, the shadow home secretary, and former soldier Dan Jarvis are also likely to consider a bid, he added. In a Sunday Times interview, Ms Kendall, the MP for Leicester West, followed Tottenham MP David Lammy in saying she would be interested in being leader. "I think we lost because people didn't trust us on the economy. People didn't think we understood their lives, shared their values and aspirations," she said. She added that "we don't just need a new face. We need a fundamentally new approach". Asked on the Sunday Politics if she would be running for the Labour leadership, she said: "Yes." Mr Umunna used an article in the Observer to say Labour had talked "too little about those creating wealth and doing the right thing". He said: "We talked about the bottom and top of society, about the minimum wage and zero-hour contracts, about mansions and non-doms. But we had too little to say to the majority of people in the middle." And former Prime Minister Tony Blair told the Observer Labour needed to occupy the centre ground in order to win again. "The Labour party has to be for ambition as well as compassion and care," he said. "Hard-working families don't just want us celebrating their hard work; they want to know that by hard work and effort they can rise up, achieve. They want to be better off and they need to know we don't just tolerate that, we support it." Elsewhere, Mr Lammy, who is putting together a bid to be Labour's candidate for Mayor of London in 2016, said it was "absolutely time" for a new generation to "step up to a leadership role". MPs wishing to stand as leader and deputy leader have to be nominated by 15% of their colleagues in the Parliamentary Labour Party to be eligible to stand. As Labour now has 232 MPs, this means prospective candidates must get at least 35 signatures. Under rules agreed last year, all Labour Party members, registered supporters and affiliated supporters - including union members - will be allowed a maximum of one vote each on a one member, one vote system. When the election is held, they will be asked to rank candidates in order of preference. If no candidate gets 50% of all votes cast, the votes will be added up and the candidate with the fewest votes eliminated. Their second preference votes will then be redistributed until one candidate has 50% of all votes cast. Who's in the running to replace Ed Miliband? 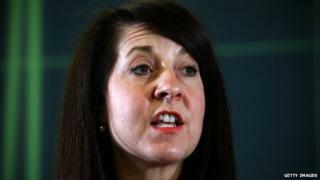 But former Home Secretary Alan Johnson has ruled himself out, saying the new leader faces a "10-year task" to rebuild Labour. He urged the party not to rush into a contest without a full analysis of what went wrong. Mr Johnson said Mr Miliband had run a "decent campaign" but he was alarmed that the party had been unable to recapture seats in the south of England it held between 1997 and 2010, such as Hastings and Thanet South. Labour, he suggested, had lost contact with Middle England. On Twitter, Jon Trickett, a member of Mr Miliband's shadow Cabinet, said people still blamed his party for "mistakes" during the New Labour era, especially the invasion of Iraq. Mr Trickett called for a "clean break" and said there was a perception that Labour and other parties were run by a "metropolitan elite". The party's deputy leader Harriet Harman, who has said she will not stand again, is to serve as acting leader until contests for the two top spots take place later this summer. Tom Watson, the party's former deputy chairman, has said he will consider running for the role, and shadow Commons leader Angela Eagle is believed to be considering putting herself forward. Mr Lammy, who is regarded as being on the right of the party, was a minister under Tony Blair and Gordon Brown having first entered Parliament in 2000. He gained a national profile for his response to the shooting of Mark Duggan in his constituency in August 2011, which sparked riots across London and other cities. Asked whether he had been approached by colleagues to run, he said: "They want me to step up for something. "I think the question is whether that is here in London or the country at large. My passion instinctively is for London." In 2014, Labour changed the rules for future contests to move to a "one member, one vote" system of party members, affiliated trade union supporters and registered supporters.